One day when my companion and I went to visit a recent convert in Colombo, Brazil, the house was full of family members. It was crowded, but they still invited us to share a message. We were about to start when the convert’s brother came in. He was not a member of our Church and was not happy about our visit. He seemed to find any way he could to contradict us. We tried to explain the priesthood, faith, and how things happen according to God’s will, but after a few moments, we felt like we had been cornered and attacked. Then “in the very moment” (D&C 100:6) we needed it, the Spirit whispered what to say. 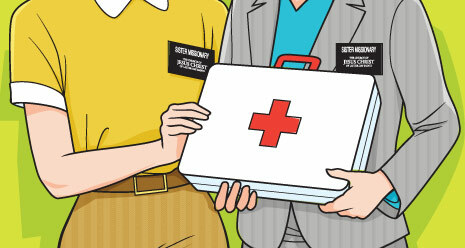 I explained that while we do believe in healing, our work as missionaries of The Church of Jesus Christ of Latter-day Saints was to bring spiritual healing to those we taught, which healing is available only through accepting the Atonement of Jesus Christ through faith, repentance, baptism by immersion, receiving the gift of the Holy Ghost, and enduring to the end. So while we believe in physical healing, we explained, the most important healing is spiritual healing. And that kind of healing was the kind we saw every day. It really didn’t matter if people were healed physically if they didn’t repent and change their lives to follow Christ. As the Spirit guided us to respond in a calm manner, the tension in the room dispersed, the brother stopped trying to fight, and we were able to share our message. How grateful I am that the Spirit prompted two somewhat trapped missionaries to remember our purpose was the saving of souls. John Tanner, quoted in Susan W. Tanner, “Helping New Converts Stay Strong,” Ensign, Feb. 2009, 23.